The Opiate (HER, MOR) Detoxification Kit includes a 16oz. 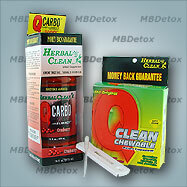 bottle of QCarbo Easy Cleanser, one QClean Chewable Detox Supplement, and one opiate test device. The Fast Opiate & Morphine Detox Program for persons under 200 pounds includes one bottle of QCarbo Easy Cleanser, one QClean Chewable Supplement, and one at home test device. Step 2) Wait 20 minutes and then refill the empty bottle with water and drink again. Step 3) Urinate several times and after 40 more minutes (1 hour after drinking QCarbo Easy Cleanser) use the included self-test kit. If results are passing (2 lines) proceed to your test immediately. Step 4) If self-test results are failing (one line) chew the QClean Tablet with 32 ounces of water.